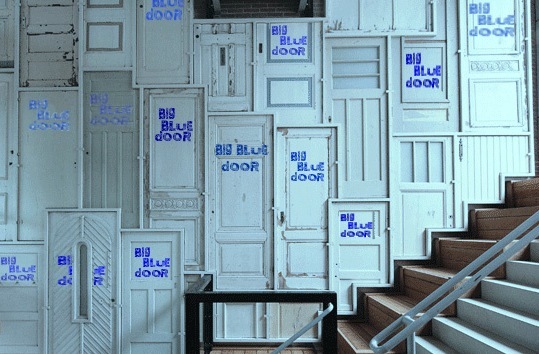 Big Blue Door is run by Joel Jones & Jennifer Jones with a lot of help from a lot of people. For current leadership go here. Joel Jones is from Charlottesville, Virginia where he got involved in plays during the formative years of Live Arts and Offstage Theater. Joel has written more than two dozen short plays (including Answer Man, Perfect Guy, Power Lunch, Tragic Hero, Big Fish Little Fish, Regatta Club Freud, and Haven’t We Met Someplace Before) that have have seen more than fifty productions in Charlottesville, New York, Boston, and beyond. His full-lengths include Shrug Like You Mean It, Fortune In Antarctica, Floating Girl, and The Election. Joel was the former Playwright-In-Residence of Third Man Productions which produced his short sketches and plays every month in the West Village for two years, and staged his full-length verse play, Shrug Like You Mean It, at the Kraine Theater. From 2005 till 2011 Joel lived in New York City where he performed regularly as an actor, storyteller and improviser at such venues as the Bowery Poetry Club, Upright Citizens Brigade Theater, People’s Improv Theater, and especially the Magnet Theater where he has performed weekly in comedy groups from 2008 till 2011. He was a founding member of the storytelling group Campfire Stories, co-producer of Black Valentines (inspired by an annual holiday party in Staunton), member of improv groups Easy Going Folks, Mono-piece Theatre, Hell Buffalo, King Canute, LL Cool JJ, and the Kicks. Joel served from 2012-2013 as committee member of The Bridge PAI’s Words Crew and Theater Crew, and served as leader of the Theater Crew. His work for The Bridge included overseeing the production of a Bread and Puppet touring show, and the Hamner presentation of the play Stanley Ann by former-UVa student, Mike Kindle. Joel’s short plays have been widely produced around the U.S. and the world. They’ve appeared as part of the United Kingdom’s Bite-Size Plays productions in the Brighton Fringe and Edinburgh Fringe plus their most recent 10th Anniversary show. Jennifer Hoffman Jones has produced, directed, and performed in dozens of theatrical and radio shows for two decades in New York and Virginia. Most recently she has worked as producer and fundraiser for the Fire Dept Theatre in NYC, and as producer for the Hamner Theater’s critically acclaimed Capital and NY Fringe show, Life Insurance.